Flowers are called gift for all occasions. may it be birth day, anniversary, wedding, boss day,valentine day, new year, Christmas, woman’s day, mothers day, father’s day, friendship day, teacher’s day, just name the occasion and the first gift that come in mind are flowers. Weather you love someone, miss someone, wanna thank someone, flowers are the best way to express your feelings. most of the time we miss the occasions and want our feelings to be conveyed to the other person or loved one’s. Every flowers, color and number of flowers and their arrangement in flowers has its own meaning. Its never easy to pick your choice, and difficult part is to get it delivered in your absence. and if its a birth day being the first to wish matters a lot or if its a valentine day then being the first to wish that to with beautiful flowers grows your love deeper. How Ecakezone Surat makes a every occasion special? Ecakezone provide Online flowers delivery in Surat, specialist in making all type of flower arrnagements with fresh flowers, best quality, along with design. Yes we mean that you can get your feeling conveyed in the form of flowers and a delivery for free. You can order the flowers from our online store https://www.ecakezone.com and view the images of beautiful flower arrangements or if you are planning for a customized flower arrangement or any other, you can call us and tell your requirement so that we can design as per your requirement. Make every occasion very special with our fresh flowers and beautifully designed arrangements and affordable prices. Flowers: This is one of the most common and yet the most pleasing surprises of all. Gifting flowers is a wonderful way of expressing your love for her. Slip in a love note in the bunch of flowers and give it to her early in the morning to give a romantic kick-start to the day. Women hugely appreciate Gerbera flowers – buy her a bunch of these flowers in vibrant colors. Chocolates: Every woman loves the scrumptious taste of chocolates. Amaze her by giving her a box full of different varieties of chocolates, preferably in heart shape – to give a Valentine touch! Cake: Order a heart-shaped or simple round-shaped chocolate cake, strawberry cake, black forest cake or a photo cake for her– the choices are aplenty. Light a candle on it and write a special message on the cake for your special one. Teddy: A very good way of saying you love her s by giving a teddy to her. This beautiful gift is sure to remind her of you each time she sees it. There lies a major difference between courting and dating a woman. Today’s generation has mixed up the two and has forgotten that love is not limited only to pleasing each other with exorbitant gifts and having parties celebrating every first of their relationship. Love is an eternal feeling, which is more about understanding your partner, commitment and deciding for the future. Be jolly: girls always admire those who can make them laugh. But take care that everything you say is taken in good humour. Make sure your jokes do not make her feel insulted. Smell good: body odour plays a vital role in deciding whether a girl will be impressed from you or will she feel disgusted. So, take a bath before seeing her, only wearing a good perfume will not work. Look in the eyes: be confident when you are around her and look into her eyes while she is talking. This will definitely leave a good impression as she likes when someone pays attention to whatever she is saying. Dress decently: fashion is not for girls only. Go to a saloon a day before your date. Dress decently in a shirt and a trouser preferably. Don’t let your first impression go wrong. Honesty is the best policy: More than anything, honest replies and comments make her feel happy. Your honesty can make her rely on you in the longer run. Respect her: Respect lures a girl more than love. Make sure you do not hurt her self-respect and pay attention when she is talking. You have all the rights to voice your opinion but do not bash her opinion. Give decent gifts: everyone likes getting gifts on special occasions. Carry some chocolates or flowers or even better order them online from Ecakezone and deliver them on her doorstep without any delay to bring that smile on her face. Be caring: though men believe that women have grown independent and can take care of herself, which is true as well but its different when it comes to her partner. When she is around you she wants to be taken care of. So make her feel warm and safe by holding her hand or holding her by shoulder. Stay loyal: Girls always adore those who they know will not cheat them for any other girl. When you are with her, be just with her. Make her believe that she is the centre of your universe. Don’t threaten her: calling her frequently or texting cute messages is undoubtedly welcomed but as said excess of everything is bad. Do not make her feel stalked by your calls and messages. Respect her space and trust her. International women’s day celebrated every year on March 08 is a day to recognize the contribution of God’s supreme creation ‘women’ in making this world a beautiful space to live in. Though a single day is not enough to celebrate womanhood but at least for one day people can thank them for all their efforts, show them respect and make them feel loved. First International Women’s Day was observed on February 28,1909. The day was started as a political event but soon everyone understood the deeper implications of dedicating a special day to women. Every year the day is celebrated with an exclusive theme associated with it to address issues pertaining to women development across the globe. This year’s theme being gender equality brings to light a precarious problem of brassiness prevailing in the society not only in India but also in many other countries. A century old saying, “ behind every man’s success is a woman,” is not an overrated statement at all. She does have a role in the success of every individual. Her strength and her succour bring positivity in the atmosphere. She plays various roles throughout her lifetime like that of a mother, daughter, sister or a wife. The biggest blessing bestowed upon women by God is the gift of giving birth to her offspring. She is the one who carry generations forward. It’s high time now to realize and recognize all sacrifices and efforts a woman make. She deserves a peaceful life with all comforts, as no one knows what stress she handles every day without even complaining. For every nation to grow, it is necessary to work towards empowerment of women. By educating a woman, you not only educate an individual but an entire family. She might look weaker physically in comparison to a man but mentally and emotionally she is way ahead of them. A woman do not react to a situation blinded by aggression, rather she is the one who will make her decisions after thinking rationally. So, accept it, this world will be incomplete without her. Our florists specialists in making beautiful flower arrangements, customized designs, beautiful wedding decorations and any type of party decorations which makes your special event attractive and more memorable. We have variety of flowers arrangements and gifts collections for valentine day, anniversary, birthday etc at reasonable price. We can help u being the first by providing a on dot midnight flowers delivery in surat. It took a long way to emancipate women since the evolution of civilization existed. The accomplishment of the women all over the world is trying to break the ceiling and more over has been successful in the last few years. The courage and braveness of women has transcended the boundaries of oppression and discrimination and has moved beyond victimization emerging as new leaders converting their struggle into triumph. Right from 19th and early 20th century from suffragette movement for “Right to Vote” till Irom Sharmila’s resistance, women has traversed many demarcations but still many need to be done. Celebrate the womanhood in your life in grand style with the cake order online in Surat. The love and affinity should not be recognized but also be celebrated with so much of respect. Respecting women is like celebrating the substance that made the world grow with the ethics and morale. The flowers reminds of the different women in your life as some are with thorns and some are very gentle and requires much attraction. 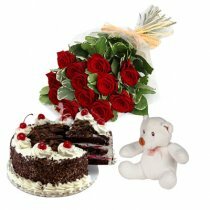 Send flowers online from https://www.ecakezone.com at very reasonable price and make the moment as moment of their life. This is the occasions which man and woman can celebrate with equal zeal and eagerness by ordering cakes, flowers and gifts online Surat which will definitely weave an unseen bond , realization of that may lead to uncommon but a nice undefined feelings which cannot be quoted in words. Send the message along with the gift only only through Ecakezone.which can make your moments much more special than you would have ever though off. Why Women’s Day is Celebrated on 8th March? International Women’s Day is a global day celebrating the social, economic, cultural and political achievements of women. The day also marks a call to action for accelerating gender parity. It was formerly known as International Working Women’s Day. It has been observed since in the early 1900′s – a time of great expansion and turbulence in the industrialized world that saw booming population growth and the rise of radical ideologies. International Women’s Day is a collective day of global celebration and a call for gender parity. According to what the pages of history have; the first National Women’s Day was more or less a political event, observed across the United States on 28 February. It was the initiative of Socialist Party of America.Women continued to celebrate National Women’s Day on the last Sunday of February until 1913.In the International Conference of Working Women held in Copenhagen in 9110, leader of the Women’s Office for the Social Democratic Party in Germany- Clara Zetkin floated the idea of an International Women’s Day. Zetkin’s suggestion with received unanimous approval and thus International Women’s Day was born.International Women’s Day was celebrated the first time in Austria, Denmark, Germany and Switzerland on 19 March. More than one million women and men attended the rallies campaigning for women’s rights to work, vote, be trained, to hold public office and end discrimination. In 1913 following discussions, International Women’s Day was transferred to 8 March and this day has remained the global date for International Women’s Day ever since. In the same year, it further spread to other European countries. Women’s Day is celebrated in many countries and with full fervor. Be it a working woman or a home maker, both are equally rewarded by love from family and society. There are many kinds of events and celebrations organised in companies, societies, clubs, etc. Woman empowerment activities are held at a very large scale so that women know their rights and laws. A global network of rich and diverse local activity connects women from all around the world ranging from political rallies, business conferences, government activities and networking events through to local women’s craft markets, theatrics performances, fashion parades and more. The International Women’s Day logo is in purple and white and features the symbol of Venus, which is also the symbol of being female. The faces of women of all backgrounds, ages, and nations are also seen in various promotions, such as posters, postcards and information booklets, on International Women’s Day. Various messages and slogans that promote the day are also publicised during this time of the year. Celebrate Women’s Day with ecakezone.com! Make your mother, sister or wife realise how important is she to the society by sending her adorable gifts on the special occasion of Women’s Day.